Looking for the best brush for Labradoodle dogs? Whatever your dog’s coat type, we have the best brushes for you. From puppies to adults. 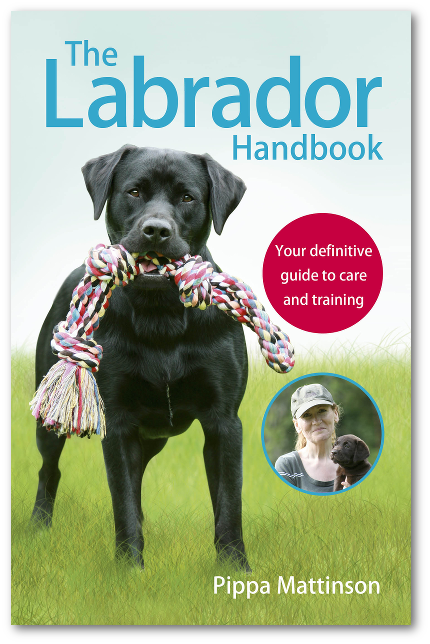 Along with a complete guide to how to groom a Labradoodle. Labradoodles were the first-ever “designer dog.” Did you know that? 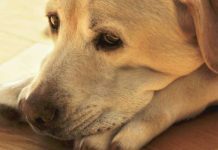 They had a very noble start, when a blind woman wrote to the Royal Guide Dog Association of Australia asking for help finding a guide dog her dog-allergic husband could tolerate. This letter led to the creation of the Labradoodle. A dog that helped that blind woman to navigate her surroundings without aggravating her husband’s allergies. Today, as you no doubt already know, Labradoodles are wildly popular for many reasons. They are known for their intelligence, personality, trainability and adorable appearance. But there is one area where many new Labradoodle parents still struggle, and that is grooming. 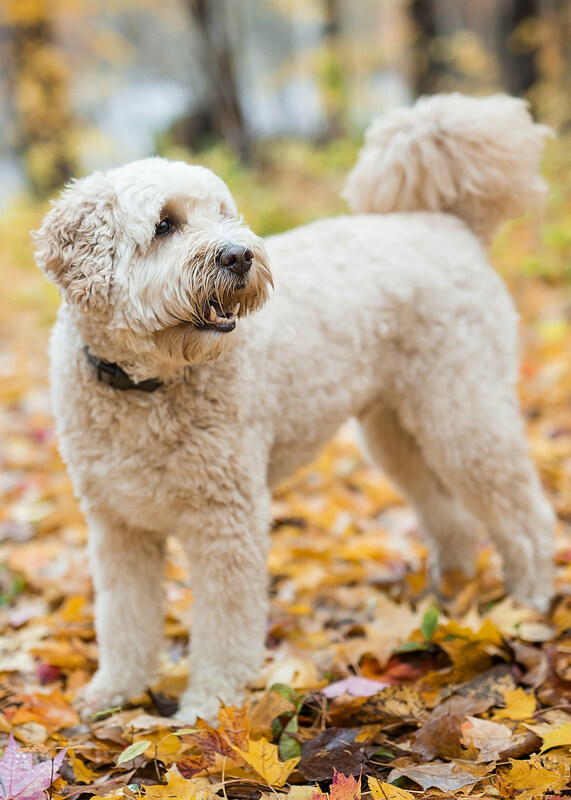 In this article, learn everything you need to know about how to groom your Labradoodle at home! Labradoodle grooming is more challenging than appearances may indicate. First, there is your squirmy dog. They may not quite grasp the critical nature of the task at hand and just wants to play! Next, there is all that fur! It is just everywhere! Whether your Labradoodle takes more after her Poodle or Labrador Retriever parents, both are very hairy canines in their own right. Speaking of which, the type of fur your Labradoodle pup has depends on what DNA she got from each parent. Hair. “Slick” and NOT allergy-friendly. This coat type shows a heavy Labrador Retriever influence. It sheds a LOT and can emit an odor. Fleece. “Wavy” look and allergy-friendly. This coat type shows an even influence from each parent. It sheds much less and typically has no odor. Wool. “Curly” look and allergy-friendly. This coat type shows a heavy Poodle influence. It doesn’t shed much and typically has no odor. The best brush for Labradoodle fur will depend upon which coat type your dog has. But whatever the fur type, grooming is essential for these dogs. Mats can form quickly, and be distressing as well as unhygienic for the dog. So let’s make sure you are armed with everything you need to keep her happy. So your first step here is to determine what kind of coat your Labradoodle has. You’ll need to decide before you can answer the question of what kind of brush for Labradoodle fur is most appropriate. For instance, does her coat look more flat or smooth? In this case she probably has a “hair” coat. This coat is actually the easiest to care for, although allergy sufferers should steer clear due to the shedding. Or is her coat more wavy and soft to the touch and doesn’t seem to shed much or smell? It is likely she has a fleece coat. A fleece coat is high maintenance in that it can tend towards matting and tangles if you don’t brush it at least a few times per week. If your Labradoodle’s coat is extremely thick and curly with multiple layers of curls but has very little shedding and no odor, the chances are good she has a wool coat. A wool coat is the highest maintenance coat type and will likely need daily maintenance brushing. Known you have an idea of your coat type, we can look at some choices when it comes to the best brush for Labradoodle hair! The specific tools you will need to groom your furry guy or gal will depend on coat type. They will also be affected by how much of the grooming you plan to do at home. For instance, you might want to do the regular brushing and combing, but let a professional groomer do haircuts and trims. Here, it just depends on what you feel comfortable doing yourself! Try to find a Labradoodle brush with a sturdy handle, long densely populated thin pins (bristles) and soft ends. A wide-tooth model with longer well-spaced tines (teeth) is best. 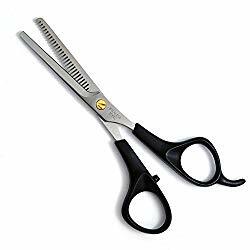 Choose straight-edge scissors with salon-sharp edges. 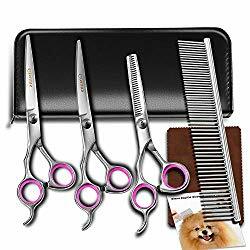 This set of scissors even comes with the comb included, although it might not be wide spaced enough for your Labradoodle’s fur. These look like a brush and a comb had babies. They have scissor handles and comb edges. You want a pair that is really sharp and strong. You can use a detangling spray, gel, conditioner or some combination. 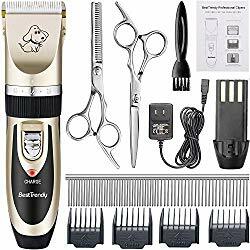 If you plan to clip your pooch yourself, you will want to choose a clipper with several blade options so you can trim to different coat lengths seasonally. This set is very popular, and even comes with a lot of the other tools you will need such as the scissors. Now that you have identified which coat type best describes your Labradoodle, let’s talk more about the best brush to use! 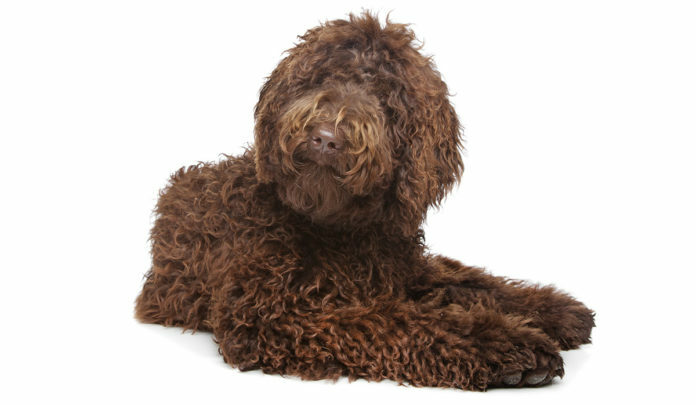 NOTE: In this section, we will assume your Labradoodle is at least one year old and now has his adult coat. The next section will talk specifically about grooming tools for puppies. Because this coat type can shed heavily, you want a brush that makes it easy to brush out stuck shed fur and clean the brush afterwards. This coat type won’t shed so much, but it is very fine and delicate, and you want a gentle brush that won’t overpower or damage the delicate fur fibers. This coat type barely sheds at all, but it can be tremendously thick, with multiple curling layers to work through. You want a strong brush with long tines (teeth) to catch all coat layers. Best brush for Labradoodle Dogs coats of any type! Luckily, you don’t have to buy a different kind of brush for each type of coat! 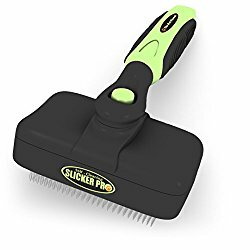 Use this tool to brush all the way through the dense layers of your Labradoodle’s coat to remove mats, tangles, dead hair and debris. The Pet Portal Pro Quality Self Cleaning Slicker Brush for Dogs. This handy slicker brush comes in two sizes and two colors. It’s designed to suit the needs of short and long-haired pooches. When it comes time to clean the brush, one button push and the hair is ejected. The bristles are flexible and soft enough to cause no skin burn from brushing. The manufacturer offers a 5-year guarantee, so you know it’s built to last. Use this tool to groom the underside of your Labradoodle, including the more sensitive areas on the belly and abdomen and around the feet. 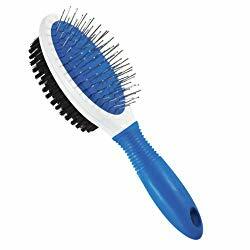 Go Pets Professional Double-Sided Pin & Bristle Brush. This two-in-one tool gives you a backup slicker brush as well as a sturdy bristle brush. 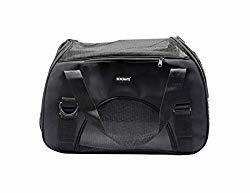 This can be especially handy for when you travel. The bristles and tines alike have rounded ends to avoid any irritation to your pooch’s skin. 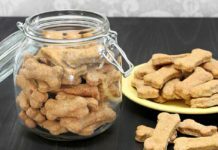 Best of all, the manufacturer offers an open-ended satisfaction guarantee and the company donates a portion of all proceeds to animal charities. 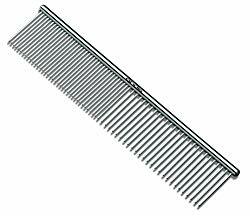 You can use the comb anywhere there are mats or tangles in space-sensitive areas, as well as to groom the beard, face and ears. 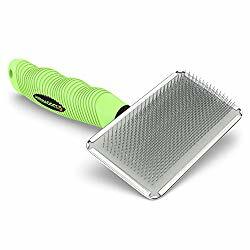 Andis Pet Steel Grooming Comb. 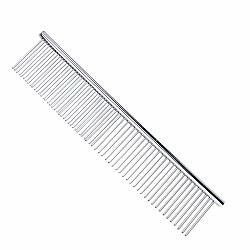 This light, hypoallergenic stainless steel grooming comb comes in 7.5-inch and 10-inch sizes. The tines are sturdy and well-spaced to reach the inner layers of fur and gently work out tangles and mats. If your Labradoodle is six months or younger, she likely still has her puppy coat. Labradoodle puppies can begin transitioning from their puppy coat to their adult coat as early as six months or as late as 15 months. You can help your Doodle pup have the best possible adult grooming experience by starting her on Labradoodle puppy grooming around two or three months of age. If your Labradoodle will have an adult “hair” type coat, she will likely shed out most of her puppy coat. Here, your brushing will assist with the transition but is basically a minor player. But if your Labradoodle will have an adult “fleece” or “wool” type coat, she probably won’t shed out much of her puppy coat on her own. This can cause follicle irritation as her adult coat crowds in alongside her puppy coat. Here, your brushing will really help ease her puppy coat out to make room for her adult coat to grow in. 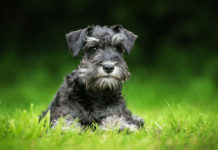 Labradoodle puppy coats often don’t look much like the “real deal” – the hairs are thinner, wispier and more delicate. You want a gentle brush with mid-length tines (teeth) and soft ends that will never scrape or pierce her skin during the transition. Hertzko Self Cleaning Slicker Brush. This fine-tine grooming brush is soft and gentle on your puppy’s sensitive skin and hair. The brush massages your puppy as you groom, bringing blood flow to the area for a healthier, shinier adult coat. Cleaning is a breeze: just push a button at the base of the handle and the hair is ejected. Happy Dogz Pro Slicker Brush for Dogs. 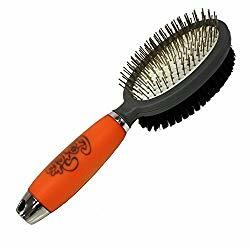 This brush is designed to work gently to remove mats and tangles even for dogs with sensitive skin. There are two sizes (small, large). It works well with shedding and non-shedding coats of single or multiple layers. The manufacturer offers a 10-year 100 percent money-back satisfaction guarantee. Oster Large Combo Brush for Dogs. This brush is two-sided: one side is a traditional slicker brush and the other side is a traditional bristle brush. 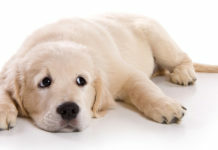 You can choose which side to use based on the stage of transition of your puppy’s coat. 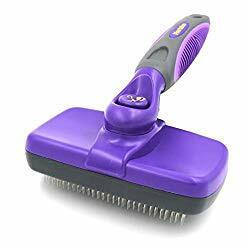 The best part about this brush is that the tines (teeth) are mounted in a flexible rubber base so they move with you as you brush to avoid scraping your puppy’s skin. There are two basic grooming cuts: the summer cut (one to two inches) and the winter cut (three inches or longer). 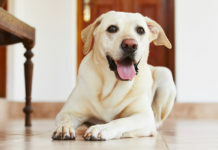 Both have your dog’s comfort as well as sanitation and seasonal coat maintenance foremost in mind. Of course, depending on what type of adult coat your special canine sidekick has, these two traditional cuts can look quite different from Doodle to Doodle! These tips offer general guidance if you wish to groom and clip your Labradoodle at home. Learning how to groom a Labradoodle face is all about transitions, as the following sections detail. You always want to make sure your dog’s eyes are not covered or obstructed in any way with hair/fur. This can cause eye irritation as well as other dangers from obstructed vision. Many groomers like to trim the area above the eyes to give an appearance of eyebrows. How much trimming is done around the ears will depend on how long and shaggy your Doodle’s individual coat is. You always want the ear trim to match the rest of your dog’s coat! It is a good idea to trim the hair just underneath the ear for air ventilation. As well, trimming or plucking excess inside ear hair can help decrease wax buildup and risk of ear mites. The current fashion is trim the feet just a hair longer than toenails – sort of like when you wear the hem of your pants slightly long when paired with high heels. Today’s trends highlight three trim styles – a two-inch cooling summer trim, a three-inch standard trim (winter or transitional weather) or a fun “goatee” type beard. Whatever look you choose, just be sure the transition from one area to the next is smooth and matches the rest of your dog’s coat. The tail should be trimmed so that there is a smooth transition from body fur to tail. It is always a good idea to trim the area around your dog’s privates for the sake of hygiene. This includes the hair under the tail on the back side of the legs. 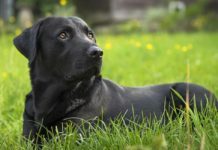 A summer coat cut might be around one-inch long, while a winter cut might be two inches or longer depending on the local weather in your area and the degree of curl or wave in your dog’s coat. For trimming your dog’s head, a smoothing transitional cut of two to three inches is standard. Another great way to learn how to groom your Labrador is to check out some professional videos on YouTube. Skip past the advert at the beginning, and this gives a great demonstration of how to groom a Labradoodle. But to follow along, you will need to have the right tools. The best brush for Labradoodle fur will depend upon his coat type. And if you plan on doing all of your grooming at home, you will need a good selection of tools too. Even if you take your doodle dog to the poodle parlor on a regular basis, regular grooming at home will still be essential to keep that messy mane under control. We hope you have enjoyed this overview of Labradoodle coat types, brushing tools and grooming standards! Cotroneo, C., “Here’s A Scary Fact Every Dog Owner Needs To Know,” The Dodo, 2016. Bonham, M.H., “Labradoodles: Everything about Purchase, Care, Nutrition, Behavior, and Training,” Barron’s Educational Series, 2007. Fiedler, E., “Americans love designer dogs but health problems are common,” WHYY, 2017. Barker, L., “Grooming Guide – Labradoodle – Pro Groomer,” YouTube, 2013. Hale, H., “ALAA Australian Labradoodle Grooming Demo,” YouTube, 2014.